Previous post: Get a Free Christmas Short Story By Gretchen Archer! Details at the end of this post on how to enter to win a copy of Antiques Ho-Ho-Homicides along with a link to purchase the book from Amazon, and an indie bookstore where a portion of the sale goes to help support KRL. The novella “Antiques Slay Ride” has the Borne women investigating the death of a Christmas decorations collector, with the ladies motivated not so much by the need for justice but by the lure of an extremely valuable collectible. “Antiques Fruitcake” finds Vivian in her element, writing and directing Serenity Playhouse’s original production of The Fruitcake That Saved Christmas. The title proves a wee bit ironic when poisoned fruitcake takes out the off-off-Broadway star Madeline de Morlaye (formerly known as Hildegard Gooch). Concluding the collection, “Antiques St. Nicked” finds Santa Claus dead in his sleigh, with treasures once more compelling the Borne women to test the sheriff’s patience and their ability to bend the law. The combination of Christmas and murder has never been so much fun, nor such a perfect blend of hilarity and the warm sentiments of the season. Vivian and Brandy are mostly on their meds throughout the tales, but that never restricts their need to find answers (if they do so before law enforcement officials, all the better). Parenthetical asides that have Vivian and Brandy speaking directly to the reader – and often arguing with their editor – break down the fourth wall as they make Meta commentaries on the mystery genre as a whole. This is the perfect Christmas gift that lasts throughout the year, delivering more than its share of light-hearted entertainment and laugh-out-loud moments. 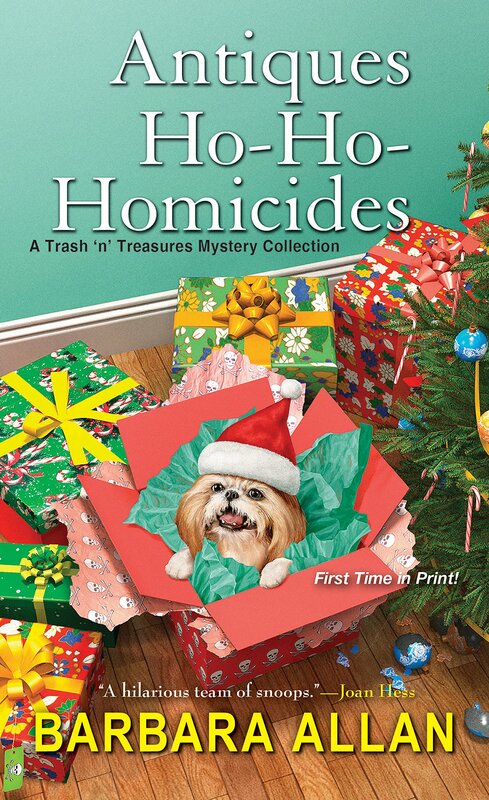 To enter to win a copy of Antiques Ho-Ho-Homicides, simply email KRL at krlcontests@gmail[dot]com by replacing the [dot] with a period, and with the subject line “ho ho,” or comment on this article. A winner will be chosen December 8, 2018. U.S. residents only. If entering via email please include your mailing address (so if you win we can get the book sent right out to you), and if via comment please include your email address. You can read our privacy statement here if you like. This one really looks good —thanks for all the info! I don’t remember if I have read any of this series. A novella would be a good starting point. I love this series. Thanks for the review and giveaway. I am always on the look out for short story collections for my mother, 96, who has problems with large casts of characters. This sounds like it might be of interest to her. These books are hilarious! I love the characters, their antics, and the problems they get into. You just never know what is going to happen next with those two. Great cover!.sounds like another great Christmas story. Looking forward to reading. I’m not usually a fan of short stories, but since I’ve read all the books in this series I have all the background which enriches the reading of short stories I would like to give these a read.